March 8, 2017, Toms River, NJ – Every year on March 2nd, The National Education Association celebrates Dr. Seuss’ birthday with ‘Read Across America Day,’ an event focused on encouraging children to read. 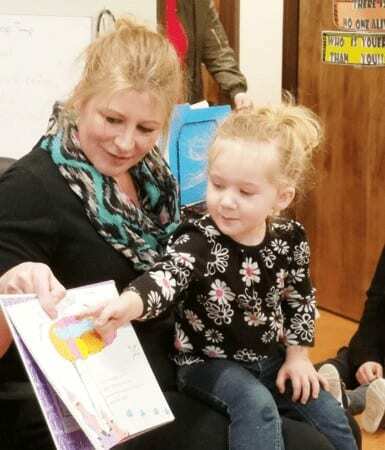 American Institute’s Toms River campus takes part by organizing a special reading event for the children of students and staff. Families of students and staff arrive to find the campus decorated with characters and quotes from Dr. Seuss’ books, with complimentary copies of his books handed out to the first ten children to arrive, and children also enjoy coloring activities and refreshments. American Institute celebrates education at every level, and strives to create opportunities to connect with the community. Read Across America is a particularly popular event, because it allows students and faculty to share their love of reading with the next generation. Most of all, the adults enjoy watching the children respond to the stories. One young girl was so excited by the story that she jumped out of her seat and waved two balloons, while a very young baby surprised his mother by listening intently through the entire event.